Orktober 2017 #3: RTB02 Space Ork Raiders Discipline-Master Thrugg Bullneck (1988) | Azazel's Bitz Box. This entry was posted in 40k, 40k Orks, Oldhammer and tagged 40k, kev adams, Oldhammer, Oldhammer 40k, Orks, Rogue Trader, RTB02, Space Ork Raiders, Space Ork Thrugg, Warhammer 40000, Warhammer 40k. Bookmark the permalink. It’s amazing how you made models, that I would normally overlook, become must haves! Cheers mate. I’ve been outside stripping more of these guys tonight, so expect some more of them in the future! Thrugg! That’s it! Where did you find his name? I’ve forgotten the names of the Space Ork Raider it’s been so long – and I’ve not been able to find them again! Thrugg Bullneck is the boss, and Hhruk is the Lt. I think? I’m sure it’s out there somewhere – try googling the RTB02 box art? Good idea. SOL should have it. Thanks for the name prompts as well. I’ve updated the post title! The camo, leathers, and weapons just look amazing on these! Thanks mate. I’m trying for an old-school palette meets new school style kind of thing. These are Space Orks after my own heart for sure (though I would not have been able to resist the bright red plasma pistol! ); brilliant work! Heh. The turquoise comes from some of those early-RT plasma guns – or at least how I seem to remember them – looking at them in the old catalogues sees a lot of drybrushed silver, and admittedly, the first time it was painted it was bright red. More than cool! Love how you are pulling these together – RESURRECTION! Thanks Mark – Old models doesn’t mean crappy models. Not by a long shot! I don’t have many of the Minifigs I inherited from my brother left – almost none in fact, sadly. They (mostly? all?) dated from the 1970’s, are older than any Warhammer models I own and were my first models. Not that I bought them myself. 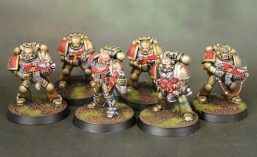 In terms of 40k figures, though – these are about as old as it gets – and there are quite a few people out there who tend to (loudly) think that the old models are all garbage, especially when compared to the latest hotness. By the same token, there are a lot of people who seem to think that only the old models have any merit – because they were the ones they played with as a child/teen, and that anything past (insert arbitrary date) isn’t “proper” “Oldhammer” and is therefore soulless crap. It’s the painter, not the brush, or even the model! Though I have a lot of unpainted minifigs too, I think even those from the 70’s and 80’s can and should be brought to proper glory! I’ll dig out the giant rat that I still have. It’s not on here, so I must have painted it a couple of years ago before I got back into doing the blog. Pingback: Realm of Chaos – Nurgle’s Children 2018 #1: Kev Adams Plaguebearers (1991) | Azazel's Bitz Box.